I hope all of you had a wonderful time of celebration with friends and family this week. Christmas is truly a time for celebration! All of our everyday concerns become petty when we contemplate the astounding idea that God became man. This weekend, as you enjoy the company of friends and family and look forward to the new year, take a moment and watch America the movie together. America tells the true story of our great nation and is sure to spark a discussion: is America great? America is available to stream instantly online—just click here to watch now! Did you know? If you got a new tablet for Christmas (a Kindle, an iPad, a Nook, or just about any other tablet), you can read the digital edition of America the book! America: Imagine A World Without Her provides a more in-depth look at the topics discussed in America the movie. Read America to learn what America's past can tell us about her course for the future. Click to download now. I had the pleasure of guest hosting The Rick Amato Show on Christmas Eve, and I'll be hosting again tonight. The Rick Amato Show airs at 10:00 PM ET on Verizon FiOS 616 HD/116 SD AT&T U-verse 1208 HD/208 SD. My daughter Danielle will make a special guest appearance tonight. Hope you tune in tonight! P.S. Last week, I told Steve Malzberg in this video that Obama's Cuba actions have been a vindication of the thesis of my 2016 film, in which I argued that Obama was a militant anti-colonialist. Email sent to us@peninsulateaparty.org on December 26, 2014. Merry Christmas! I wanted to write you a note now to ensure you received it before the hectic holiday rush sets in on Christmas. I'm excited to have my daughter Danielle home this week for Christmas, and I'm looking forward to seeing your Christmas messages, photos, and posts on Facebook and Twitter over the next few days! As you spend time with friends and family this week, take a moment to stop and remember what a difference the man for whom we celebrate has made. Before Christ, the world of classical antiquity was defined by slavery, bloodthirsty entertainment, and pederasty. Now through Christ, we can all find forgiveness and salvation. History would be unimaginably different if this one person named Jesus had never lived. Wishing God's many blessings upon you this Christmas season and beyond. P.S. Here's a great picture of my Latino class after singing Christmas carols at St. Jude's Church in San Diego this month. Email sent to us@peninsulateaparty.org on December 23, 2014. Win A Signed AMERICA DVD! Have you heard? I'm giving away signed and personalized copies of America the movie every day between now and Christmas! You'll have a chance to win each day that you answer the daily question on my Facebook Page! Click here to enter now. If you don't win, you can buy a signed copy of the DVD on the America website! We have a limited number of signed DVDs, so order your copy before they're gone! This exclusive signed DVD will make the perfect Christmas gift for any patriot on your list. Order now! The official America store also has bulk packs and special combo packs, all shipping in time for Christmas! Click here to order now while there's still time to get your gifts delivered before December 25! Last weekend, I was honored to arrive at a packed-out Barnes & Noble in San Diego. I had the opportunity to sign books and take questions. Thank you to everyone who came out to support me! If you missed my book signing in San Diego, I'm excited to announce that I'll be speaking and signing books at FreedomFest 2015 next year! FreedomFest is a great gathering that takes place in Las Vegas, NV every year, and my talk is called "What It's Like to be a Political Prisoner in America," one you surely won't want to miss! Register now for FreedomFest 2015 and get a special early bird rate! In Florida last week, the bill that would require America to be shown to all public school students made a giant leap forward with a House co-sponsor. Check out what this Florida State Representative had to say about America! What do you think? Should students in school be exposed to the conservative argument? Send me a tweet! Email sent to us@peninsulateaparty.org on December 19, 2014. In a bit of uplifting news this week, Republican Bill Cassidy beat out Democrat Mary Landrieu in the Louisiana runoff. Cassidy's winning theme against Landrieu was "I represent Louisiana. She represents Obama." Mary Landrieu's crushing defeat shows the Democrats have been largely run out of the South, a place they largely controlled during the Civil War era. 1. DVD prices have been reduced for Christmas shopping! If you're looking for the perfect gift for fellow patriots, this is it! America is available in multipacks for stuffing stockings or bundled with 2016 for a combo gift. Check out all the buying options and give the gift of knowledge this Christmas! 2. 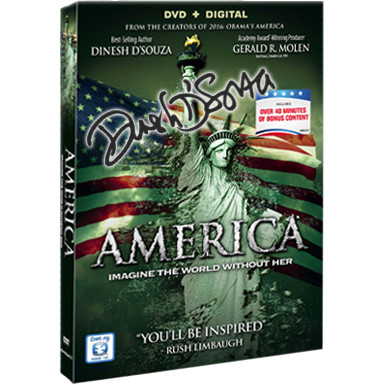 For every America DVD you purchase, we'll donate an Education Edition DVD to a school or student! So by giving the gift of America this Christmas, you're not only giving a great gift to your friends and loved ones, you'll be helping students discover the great American story, a story that many of them have never been exposed to. Before I leave you this week, I have a great picture to share with you. As a part of my court-ordered community service, I teach English to Spanish-speaking immigrants in California. Last week, I took this picture with my students–we're all reading copies of my book on Christianity! Thank you for your continued support, and please let me know if you'll be buying America for anyone on your Christmas list this year! Send me a tweet. Email sent to us@peninsulateaparty.org on December 11, 2014. Last week, I was on The Kelly File to discuss liberal bias in America's schools. Professors are in a position of great power over students who are dependent on the professors for a grade, and they are often able to dictatorially use this power to promote their own ideology. So what are they really teaching our children? I was also on Newsmax with Steve Malzberg this week to discuss the latest unrest in Ferguson, which was really due in part to the Obama administration, which has been sending race hustlers there to stir the pot. It's an old formula that goes back to Jesse Jackson and Al Sharpton. If there isn't racism in America, these guys are out of a job, so they have perfected the art of manufacturing racial resentment. When we hear about the police as an "occupying force" in Ferguson, it's the distinctive voice of the anti-colonial ideology that I discussed in 2016: Obama's America. If you haven't yet seen my film on Obama (or even if you have), watching it now will give you a new insight into the Obama way of thinking about justice, freedom, and how to govern during situations like the one in Missouri. Give the gift of America this Christmas! We have discounted bundled packs of 2016 with America right here. Get a copy for yourself and give a stocking stuffer to fellow patriots this December! By the way, for a breath of fresh air, check out what these black guys are doing to help out local business owners in Ferguson. P.S. I think GQ was wrong to put Obama on the "least influential people" of the year list. Obama was influential in taking the Democrats down this year. What do you think? Email sent to us@peninsulateaparty.org on December 4, 2014.